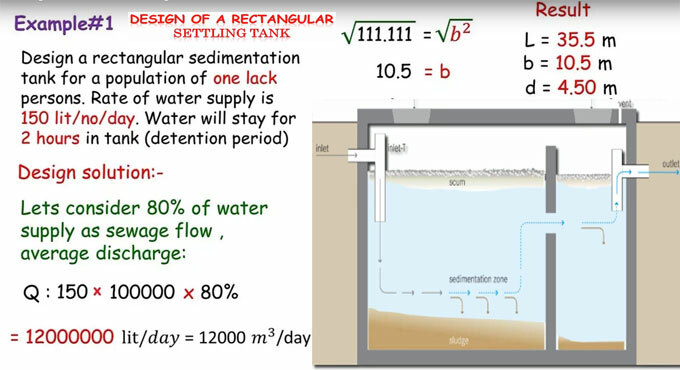 In this construction video, one can gather knowledge on how to create the design of a rectangular sedimentation tank or settling tank. problem #1 :- Design a rectangular sedimentation tank for a population of one lac persons. Rate of water supply is 150 lit/no/day. Sedimentation tank alias settling tank or clarifier, is the element concerning the recent system of water supply or wastewater treatment. In a sedimentation tank, when water passes slowly via the tank to dispose suspended particles from water or wastewater. In that way, purification is maintained to some extent. A layer of amassed solids, known as sludge, develops at the bottom of the tank and is discharged occasionally. In drinking-water treatment, coagulants are included to the water before sedimentation so as to make the settling process better, which is accompanied by filtration and other treatment steps. In current sewage treatment, primary sedimentation is accompanied by secondary treatment (e.g., trickling filter or activated sludge) to enhance the effectiveness of purification. Sedimentation is normally directed by treatment with the use of bar screens and grit chambers to eliminate large objects and coarse solids.